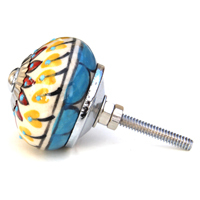 We are a family run business specialising in ceramic door knobs. Why door knobs? Because they're so lovely! Our family has been in the furniture industry for over 30 years.This experience has taught us that it's the detail that really makes furniture stand out from the crowd. In both my professional and private life I have had occasion to look for beautiful drawer pulls and cupboard door handles. And in both lives there were, of course, budget limitations! The ideal changes to make to a piece of furniture are inexpensive, high impact changes that instantly make a piece look more beautiful. New furniture can very quickly blow the budget and in the current climate it is advisable to make the most of what we have. This is what has lead us to searching for striking ceramic knobs. But they needed to be at the right price... And this is why we have sourced our own! Knobbles and Bobbles source high quality ceramic door knobs at excellent prices. Furthermore, our ethic is to keep all our costs as low as we possibly can and to pass all these savings on to our customers.